There are some things I only realise and identify as mistakes after I’ve made them. My fascination with time travel is in line with my belief in past lives. Also parallel universes. Today is Ella Fitzgerald’s birthday. Listen to her sing Someone to Watch Over Me. What I said to you earlier still echoes: living here, living in a third-world country, where corruption is a way of life—it limits most things: perspectives, opportunities, etc. There is a struggle to rise above it all, but the problem is one always feels like no matter how much work you put into things, there’s still a ceiling there, and the sinking suspicion that maybe you will never get out. The older I get the smaller the world seems. So I’m glad I have friends like you who make me realise that there is so much more out there. P.S. I liked The Perks of Being A Wallflower, though I’m sure it would’ve made a much deeper impact on me had I come upon it earlier in my life. I read it when I was already in college, so my feelings were more of nostalgia for what once was. There was a sense, while reading about Charlie’s angst and pain, that it would have been useful to have this book when I was in my early teens. It could have been a potential lifesaver, because Charlie represents most of us at a young age: ill-equipped to handle problems, especially adult problems. Also, personally: the psychology behind being a wallflower was important to me, because I am one. Nevertheless, there are some things that are still true, after all these years, such as: that one can both be happy and sad at the same time, and that we accept the love we think we deserve. P.P.S. I stayed away from the movie version. I plan on still staying away from it. But: is it any good? 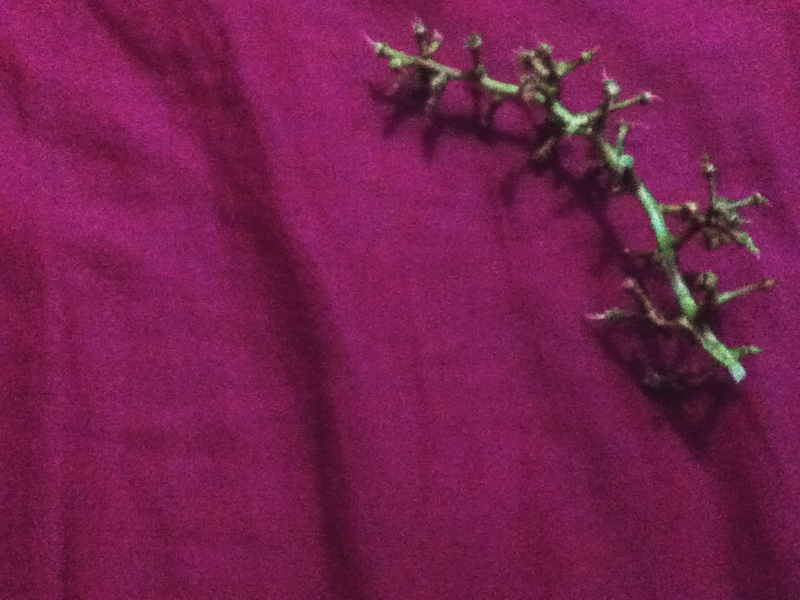 Grape stems are Bloom’s new favorite toy, because they are light enough to skitter, but heavy enough to bounce across our wooden floors. Plus, she can pick them up in her mouth and bring them back. It reminds me of a dog with a stick. But I think she also thinks it’s like an alien spider. I thought of all of this and laughed when I saw your picture today. This cat is pure comic relief.